What if we told you the most dominant distance runner in the NCAA system over the past two years might not attend a university inside the contiguous United States? 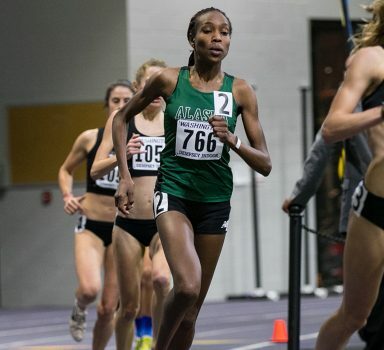 What if we told you that same athlete, who just obliterated a divisional record that had stood for nearly 31 years, didn’t truly start running regularly until one year before she arrived on campus? 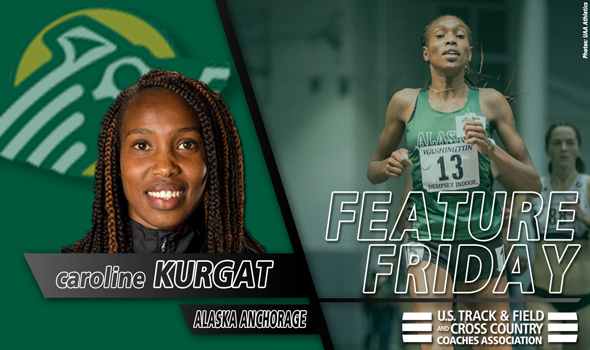 Let us introduce you to Caroline Kurgat, a senior at NCAA Division II Alaska Anchorage. Since the start of the 2017-18 academic year, Kurgat is 11-1 in championship races as an individual, with her lone loss coming at the 2018 GNAC Outdoor Track & Field Championships when she placed runner-up in the 1500 by 0.11 seconds. When Kurgat does win – and it seems routine by now – she wins by a lot: Try an average margin of victory by 32 seconds. OK. OK. You’re probably still focused on what you read three paragraphs ago. You know, how she wasn’t really a runner until she found out she had extended family vouch for her more than 8100 miles away from Eldoret, Kenya, where she calls home. Friess quickly realized he had nothing to worry about with Kurgat. “From our first conversation, I could tell she was a very driven individual with some big goals,” Friess said. “I knew she wanted to be in the nursing program, which is pretty competitive here, so I knew she wasn’t going to take her opportunity lightly. Patience and perseverance paid off in a major way for Kurgat and the Seawolves. Once Kurgat put the aerobic foundation in place, her times dropped exponentially. She lowered her PR in the indoor 3000 from 10:53.76 to 9:07.05, her PR in the indoor 5000 from 16:46.49 to 15:28.46, her PR in the outdoor 5000 from to 17:15.05 to 15:41.21 and her PR in the 10,000 from 35:28.00 to 32:08.09 from her freshman year to now. That PR in the 10K is the most recent – and arguably, most meaningful – as it happened this past weekend at the Stanford Invitational and shattered a near 31-year-old NCAA DII record. That old standard of 32:28.57, set by Cal State LA’s Sylvia Mosqueda in 1988, also doubled as the meet record at the NCAA DI Championships until last year when six women went under it. Here’s the kicker: Kurgat wasn’t even 100% in Palo Alto, California. Kurgat finished fifth overall behind Emily Sisson (30:49.57), Molly Huddle (30:58.46), Allie Ostrander (32:06.71) and Paige Stoner (32:07.36). Each of those women, with the exception of Huddle, is ranked in the all-time top-15 in collegiate history in the 10,000: Sisson is fourth, Ostrander is now 10th, Stoner is now 12th and Kurgat is now 13th as the lone NCAA DII representative in the top-25. With that record and strong performance in her pocket, Kurgat has eyes on another.